By LIEUT. 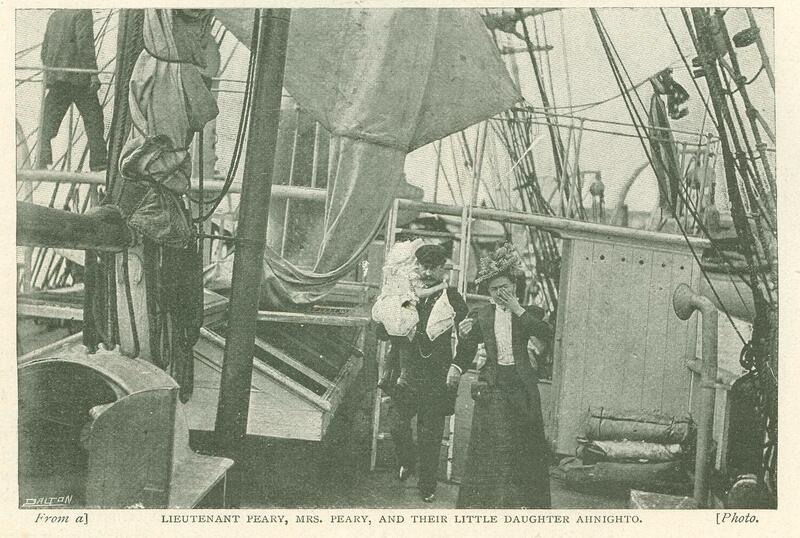 R. E. PEARY, U.S.N. illustrated by means of some very interesting photos. PECULIAR interest attaches to aerolites, those strange, rare bodies which, issuing from the infinite abyss of universal space, fall upon the earth with loud detonations, accompanied by flashes or trails of brilliant light. Legends and records, more or less mythical, have come down to us from the earliest days concerning the arrival of some of these heavenly visitants; and they have been, without exception, objects of veneration awe and even worship. Some of them have played a part in history and are still in existence, venerated for memorable associations, historical and religious. Peculiarly interesting are the "Saviksue" or Cape York aerolites, not only from their size, their unusual purity and homogeneousness of composition, and the extreme northern latitude in which they are found, but because they were apparently Heaven sent to supply one of the most urgent needs of the northerly tribe of human beings - a little family of Arctic abori­gines, numbering but a few more than two hundred souls - literally ice imprisoned in the gloomy depths beyond the Arctic Circle. These huge masses of pure, soft iron, sent to a people so imprisoned and isolated that only by a special dispensation of Providence could they obtain the precious metal, have enabled that people to pass from the Stone Age to the Iron Age. The authentic history of these interesting aerolites can be told in a few words. 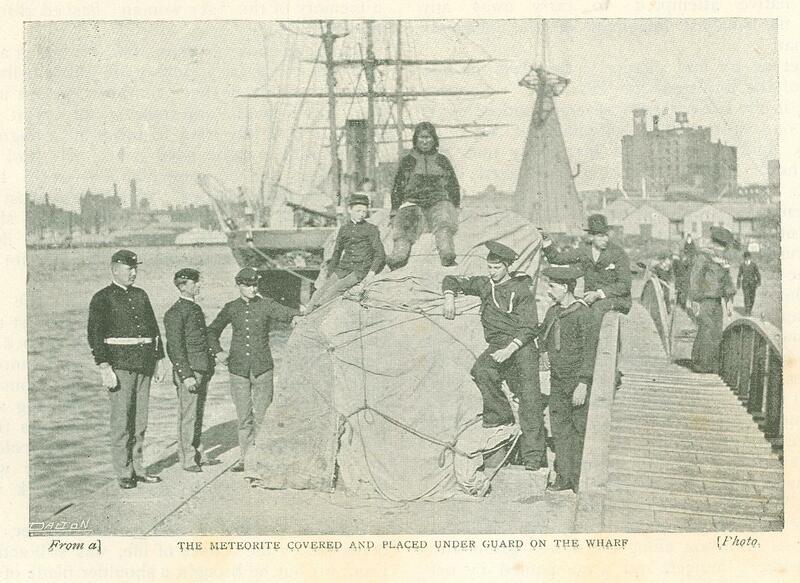 In 1818 Captain John Ross, of the Royal Navy, dis­covered the Arctic coasts in the vicinity of Cape York to be inhabited by a tribe of previously unknown Eskimos. Much to his surprise, he found in their possession iron, which they said they had obtained from great masses forming part of a mountain in their country. 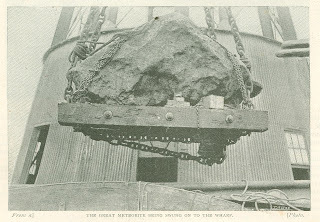 Pieces of this iron, taken home by Captain Ross and analyzed, were found to contain nickel, indicating meteoric origin. 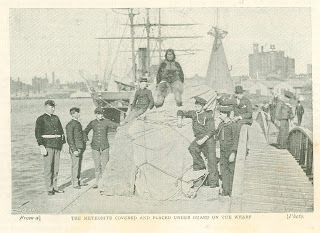 Various unsuccessful attempts to locate these "Iron Mountains" were made during the follow­ing seventy-six years, and on Wednesday, May 16th, 1894, I left my Arctic headquarters at Anniversary Lodge in search, of them, being moved to the enterprise by information which I had obtained at various 'times from my Eskimo' friends. Lee accompanied me, and my iron runner sledge, drawn by ten fine dogs, was loaded with our provisions and equipment. At the Eskimo settlement of Netiulumi, on the south side of Whale Sound, I picked up my guide Telikoteenah. This man was thoroughly conversant with the region about Cape York, where he had lived for several seasons, and he professed to be well acquainted with the location of the "Saviksue" (aerolites), which he said he had seen repeatedly. He told me that the smallest was about the size of a "mikkie" (dog) - indicating a dog curled up - the other much larger, and that they were up on the side of a mountain in Melville Bay, far to the east of Cape York. After much talk and considerable hesitation he agreed to guide me to the aerolites, and we started with sixteen dogs and two sledges. At the end of ten days of arduous sledging along the savage Arctic coast we had rounded the dark cliffs of Cape York, and were approaching the head of a little bight well into the recesses of Melville Bay. The wonderful iron stones lay on the slope of a mountain near the head of this bight, according to my guide's report, but now they were deeply buried in the winter's snows. After passing some 500 yards up a narrow valley, Telikoteenah stopped and began probing with his whip handle, until a bit of blue trap rock, projecting above the snow, caught his eye. Kicking aside the snow he exposed more shards, and told me this was the top of the pile of stones used by his ancestors in pounding fragments from the "Saviksue.'" He then indicated a spot 4 ft. or 5 ft. distant as the location of the long-sought aerolites. After bringing the snow knife from the sledge, he began excavating the snow, and after digging a pit some 3 ft. deep and 5 ft. in diameter, at half ­past five o'clock on the morning of Sunday, May 27, 1894, the great brown Heaven-born* mass was seen for the first time by a white man. After the removal of its heavy blanket of snow, I found it completely coated with a covering of ice 1/2 in. thick. This aerolite, seen from above, was of an irregular rounded trapezoidal shape, with a cir­cumference of 11 ft., a maximum length of 4 ft. 3 in., and a maximum width of 3 ft. 3 in. I estimated its weight at not less than 5,500 lbs. 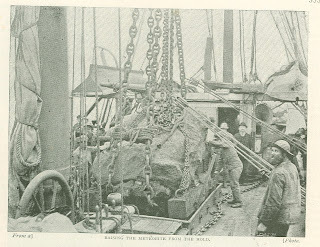 It was surrounded and partly covered by nume­rous fragments of fine grained, blue trap rock, portions of wave worn boulders and cobbles, which the natives had brought on their sledges from far up the Smith Sound Coast for the purpose of detaching flakes of the metal. The "dog" was about 100 ft. away from the larger aerolite, and I made no attempt to dig through the snow to it. Telikoteenah told me how the ancient knives of his people used to be made, by inserting several small flattened pieces of this iron in a bone or ivory back. Then he took up a piece of trap lying near and showed me how the flakes of iron were detached from the aerolite. Late in August, 1895, I rounded Cape York in the steamer Kite, which had been sent by Mrs. Peary to bring me and my two companions home. Finding Melville Bay comparatively free from ice, we made every possible pound of steam, and the Kite pushed eastward at her utmost speed in order to reach the vicinity of the aerolites before a change of wind should close the course by ice. As the snow was then melted away from the aerolite and its surroundings, I obtained a clear idea of the difficulties incident to transporting it to the ship. Standing beside it the eye roamed southward over the broken ice masses of Glacier Bay, the favorite haunt of the Polar bear; eastward, across the glacier itself, frown the ebon faces of the "Black Twins," two beetling ice-capped cliffs; northward, lie the boulder strewn slopes of a gneissose mountain; and westward, spreads the placid surface of "Saviksue Bay," which presents a striking con­trast to the berg chaos on the opposite side of . the isthmus.. In winter this region is the desolation of Arctic desolations, constantly harassed by biting winds which sweep snow in throughout the long, dark night from the broad expanse of Melville Bay, and pile it up in drifts which are hundreds of feet deep in many places. Six days after, we, of the Kite, got to work at the aerolites. They had been torn from their resting places by powerful hydraulic jacks, trans­ported down the mountain slopes to the water's edge, ferried across the open water on a great raft of ice 7 ft. thick, dragged across the bay to the side of the Kite, hoisted on board, and safely deposited in the hold, to the great relief of all concerned. Then the Kite steamed back to Cape York, and thence to St. John's, Newfoundland, from whence the aerolites were shipped home. The information I obtained from the natives in regard to the aerolites was rather scanty. According to them, the" Saviksue" (great irons) have been where I found them from time immemorial; but originally they were an Innuit (Eskimo) woman and her dog, hurled from the sky by "Tornarsuk," the Evil Spirit. By tradition the larger aerolite was, at first, in shape like a woman seated and sewing, but the constant chipping off of fragments through successive ages gradually removed the upper portion of her body and reduced her size one-half or one-third. Years ago her head became detached, and a party of Eskimos from Peterahwik, a settle­ment north of Whale Sound, attempted to carry it away, actuated probably by the desire to have a convenient supply of the precious metal, and so save themselves the long and arduous journey to Cape York and into Melville Bay when they needed to replenish their stock of iron. They lashed the head upon a sledge and started for their home, but when well out from the shore the sea ice suddenly broke up with a loud noise, and the head disappeared beneath the water, dragging down with it the sledge and dogs. The Eskimos themselves narrowly escaped with their lives, and from that time no native attempted to carry away any but the smallest fragments of the heavenly woman. 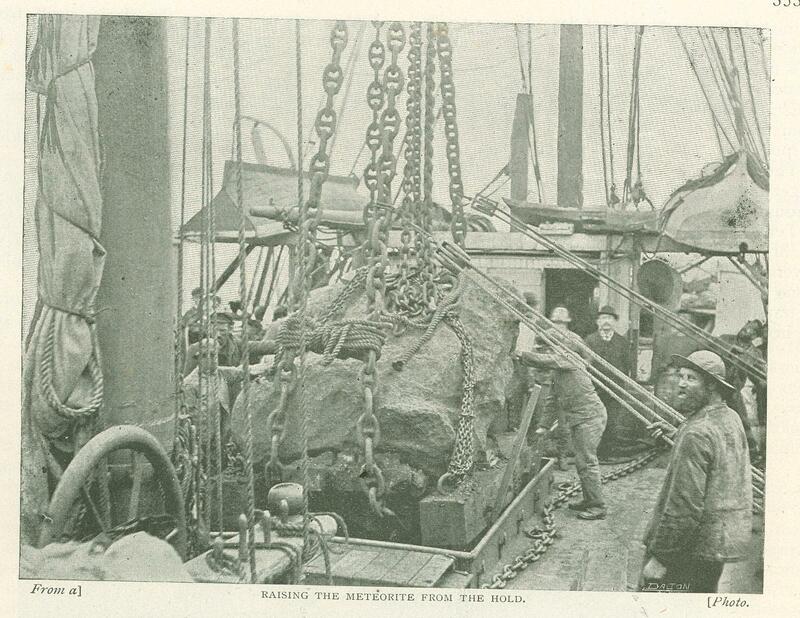 Let us try and picture to ourselves the first use of the iron from the "Saviksue": Suppose that, in the late spring of several hundred years ago, one of the most self reliant of the Cape York hunters went with his family into the depths of Melville Bay on a protracted bear hunt. Led away by the excitement of the chase he remained, until the sudden breaking of the ice cut off his retreat to the Cape. Constructing a rough stone shelter at the head of the bay, where the "sky woman" and her dog lay, he covered it with the skins of seals which he captured, and lived in comfort through the summer, hunting industriously. With the ap­proach of winter, he covered his hut deep with stones and snow, for although he could now reach Cape York, all his food, the result of his summer's hunting, was here; and here he must remain until spring. All went well with him, let us suppose, through the long, dark Arctic night till early in February, when the southern sky at noon shows for a few hours the twilight by returning day. Then a she bear, prowling along the shore - gaunt with the winter's hunger, and accompanied by her two cubs scented his cache of seal meat, and pounced on it. Warned by the cries of his dogs, the hunter attacked the robbers with desperation, but they bore off all his remaining meat, and left two of his best dogs dead, and himself with a gaping claw slash in his side. Worse than all this, the old bear carried away in her body his only flint harpoon head. So he was left without food or weapon, and his only chance was to try and reach Cape York through the darkness and bitter cold. But now, as if "Tornarsuk" (the Evil One) was angered at him, the fierce storms of the spring equinox set in, and for days and weeks the world was a dark inferno of blinding snow and deadly winds. When at last it cleared and the sun glared coldly over the southward wilder­ness of bergs, glinting the frost crystals in the air and coloring the marble heights of the Ice Cap pale yellow, our hunter and his family had eaten the last morsel of their last dog, and, starving, were chewing fragments of the skins about their hut. Yet out upon the white surface of the bay were black spots, which the hunter knew to be seals. He sought for a stone that he might utilize as a harpoon head, but all the stones were covered by the deep shroud of snow. So the man gave up hope and crouched in his freezing hut waiting for the end, which must come quickly now to his wife and babies, when a memory of the "sky woman" flashed through his brain. In the previous summer, while bringing a big seal upon his back across the little isthmus behind his hut, he had sat down to rest upon the "sky woman," and then, in the bright sun­shine, he had idly tried to break off a fragment of her with a stone lying near. He had not succeeded, yet he remembered vividly how, when. his hand slipped and struck against the place where he had been pounding, a sharp edge had cut a deep, clean gash in his flesh. Why should not a fragment of her do for his harpoon head? He spoke a word to his faithful wife and slave; then, covering the children as best they could with the remaining furs, they climbed the little valley, and with hands and feet removed the shrouding snow from the "sky woman." With a sharp stone he pounded and dug at a rough point of her knee. When he was tired his wife relieved him. Soon, the bitter cold of the fierce wind numbed them. They were likely to freeze before the tedious work was done. But though life wavered in the hunter, his brain, fed by the chance of life, was still active. From his hut he brought a shoulder blade of his last dog, and with this rude implement carved snow blocks and built a low hut over the" sky woman's" lap, just large enough for two kneeling persons. Sheltered now from the cold, he and his wife strove incessantly at the iron. At last a small scale flew off. The man seized it, drew the edge across his bare finger, and laughed with joy as it cut to the bone. But one flake was not enough. So through the long hours the two toiled till another and another had been loosened. Then while the woman slept exhausted, the man hastily, yet with all care, fashioned his harpoon ­head, setting the bits of iron along the point of a piece of bone. He fitted the bone to the shaft, and with feverish energy started out upon the ice towards one of those tantalizing black spots. See him now! When still some distance away he lies down upon the snow, and begins crawling towards the seal in the peculiar fashion of his race. But weakness tells hard on him, and before he gets within striking distance he is obliged to stop for breath. The seal takes fright, and starts for his hole in the ice. It is a terrible moment for the starving hunter. The distance of the seal is twice the range at which his blunt, flint-headed harpoon would be effective, but in despair he hurls his weapon. It reaches the mark just as the seal plunges into the water. The blow is weak, and yet the harpoon, its way cleft for it by the celestial metal, drives into the vitals, and the struggling seal is his. So starvation was averted. The "heaven woman" had given the dusky hunter full measure of sweet life, his own, his wife's, his children's. It would be not many days after this when he and. his family, once more strong and well fed, started for the "Great Cape," his precious harpoon head suspended by a rawhide thong to his bosom. Once there, his comrades, who had given him up for dead, crowded round him in surprise, which deepened when he drew the weapon from his bosom, and told them all his story. Conceive how their surprise changed to awe; think how the awe became delight, when they went out upon the ice and saw him, now no longer weak with hunger, hurl his harpoon with its small, glistening point and transfix his seal at three times the distance that their stone weapons would drive home! . Then teams of wolfish dogs, urged by adder­-like whips, spread the wonderful news through the tribe, the dusky hunters gathered from every settlement, and before the sun set for the next winter (long night), the point on every hunter's harpoon was tipped with bits of the body of the "sky woman." * " Saviksue," Eskimo word meaning great iron-stones. It will be remembered that when Mr. Peary returned from the Arctic Regions; he brought with him two large aerolites of pure metallic iron. These aerolites had been the source from which for genera­tions a little tribe of Eskimos, the Arctic Highlanders, had obtained there iron for their knives. The larger of these two aerolites, the woman, weighs about 6,000 lbs., the smaller, the dog, about 1,000 lbs. With the exception of the large Cranbourne siderite in the British Museum, weighing some 8,000 lbs., the larger of these two aerolites (the" woman") far exceeds the largest in any of the other large museums of the world. The gems of the National Museum, the Paris Museum, the Yale College Museum,. and the Field Columbian Museum weigh respectively 2,000 lbs. (estimated), 1,790 lbs., 1,630 lbs., and 1,013 lbs., while the largest in the Museums of Vienna and the University of Boar Are still smaller. * Chemical analyses of these masses of iron leave no room for doubt as to their meteoric origin, and that they have fallen from space. I'm very interested to use one of this picture for a commercial book. Where does it come from? Is it free?